This discussion includes stories from Equal about some of the attorneys, including Wendy Webster Williams and Ruth Bader Ginsburg, who fought in the 1970s to end discrimination against pregnant women. This discussion focuses on how Equal illuminates Congressional jousting about why (or why not) to confirm Justice Sonia Sotomayor for the Supreme Court. 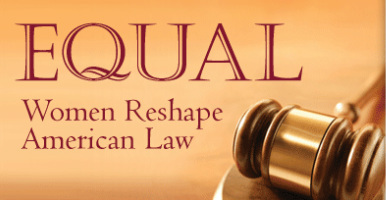 "The history of discrimination against women in the United States is long, complex, and shocking, Fred Strebeigh argues in Equal: Women Reshape American Law. Strebeigh, a widely published magazine writer and senior lecturer in the department of English at Yale University, spoke recently with U.S. News about the legal struggle for women's rights, Justice Ruth Bader Ginsburg's impact on the Supreme Court, and the importance of appointing a woman to replace Justice David Souter." Full conference, including talk by Fred Strebeigh and address delivered Vice President Joseph Biden, available as web video via Georgetown. "Only thirty years ago, men outnumbered women in American laws schools by 20 to one. The nation's legal system also has treated the sexes differently in matters ranging from workplace discrimination to government compensation. We explore how activists have tried to reshape American law and open doors for women both inside and outside the courthouse." February 19, 2009, The Leonard Lopate Show, WNYC, New York City, "Reshaping the Law"
"Fred Strebeigh tells tells the story of the female lawyers to took on sexual harassment, sexual discrimination, and violence against women . . . ."